Online Travel Agencies like Expedia, KAYAK Hotels.come are finely run machines who's primary goal is filling empty rooms. They're now the first port of call for travelers, who often bypass the hotel and go straight to these competitor analysis sites to make sure they're getting the best deal. It's easy to begrudge the listing and commission fees when in many cases much of the customer information is withheld. The upside of these sites is of course awareness and bookings through OTAs, once you have them in the door you have to take every opportunity to build the guest relationship so that they'll come direct the next time. Here are some tips to try and encourage them to stay with you the next time they visit. You've probably heard of the term "billboard effect". It was coined by Dr. Chris Anderson, an associate professor at Cornell University’s School of Hotel Administration. 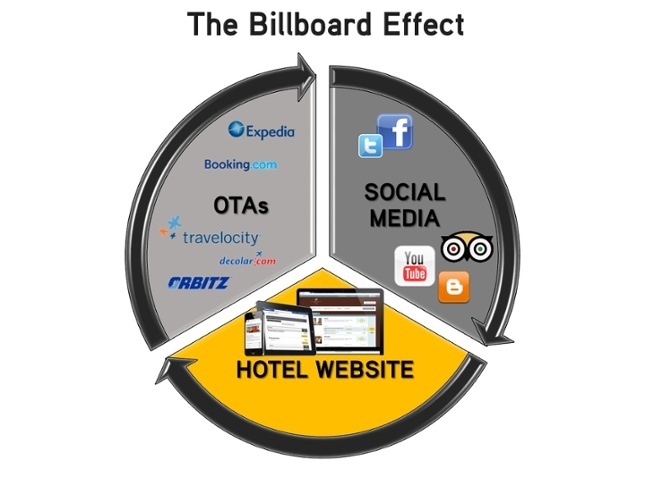 A hotel referenced on third party distributor sites - or online travel agencies gains a "reservation benefit", meaning an increase in direct bookings, in addition to the indirect bookings made through the OTA. The theory is that a significant percentage of guests start their search and find information on OTAs, but prefer to book direct through the hotel website. Booking direct on your website and/or Facebook page should be as easy: your Internet booking engine should be intuituve (Frontdesk Anywhere offers a beautiful booking engine - and the best part: it's commission free), place several booking buttons throughout your site (top navigation bar, footer, or next to room description or your hotel picture gallery), work on your term and conditions, cancellation policy and deposit strategy. Reassure guests that they're getting the best deal. Most travellers, influenced by in your face marketing, actually believe OTAs are cheaper. You need to make it clear you're offering them the best price and the best experience. Let them know that you'll ALWAYS match whatever the booking site is offering. This may seem obvious but I thought I'd include it anyway. It goes without saying that if you want your guests to book with you next time, you need to make sure they enjoy their stay. Let's repeat the basics: offer professional, friendly and timely service, clean facilities, facilitate your guest stay in every way you can, capture feedback and act on it. A fast and flexible hotel management system will help you in all these aspects. Read 4 steps to improved guest satisfaction. Collect guest details… and keep in touch! Making sure you capture guest emails once they’re at your property is a fast-win that's easy to do. Just remember to ask for their email address upon check-in or check-out, EVERY time. Automated emails are the best way to follow up and ensures all your guests receive the same experience. Once you have these details, it’s easy to send them targeted offers or promotions. What do we mean by targeted? Well families should receive specific family friendly offers. Couples should get different promotions than groups of friends or single travelers, or business travelers. Think about seasons and periods, nationality, occupation. You can tailor your packages as much as you want with the right PMS, allowing pets on ground floor rooms for example. Frontdesk Anywhere's rich profiles allow you to capture as much detailed information as you want, and export it in any format to run successful targeted marketing campaigns. While crafting your marketing message and making it incredibly appealing, remember to make your email easy to share on social media, or via emails. Satisfied guests can turn into return guests, but also into ambassadors that will recommend your property - especially when you're having promotions - to their network. Feel free to ask any questions or comment below.